Crowne Plaza® Changi Airport, named the World’s Best Airport Hotel by Skytrax World Airport Awards in 2015 and 2016, has announced the opening of a new architecturally exceptional 10-storey extension, increasing its total capacity by over 75 percent. Designed by award-winning Singapore-based architectural firm WOHA, who also designed the main building, the extension was developed by OUE Limited using Prefabricated Prefinished Volumetric Construction (PPVC) techniques – a first for a private-sector commercial project in Singapore. It features 243 Business Rooms in addition to the existing 320 rooms in the hotel, specially designed to suit the needs of today’s busy travellers. With a total capacity of 563 rooms, Crowne Plaza Changi Airport will be able to cater to an increasing number of visitors to Singapore as Changi Airport continues to grow as a key regional aviation hub with upcoming developments such as Terminal 4 and Jewel Changi Airport in the next few years. Wireless printing – to remotely print documents from the room and self-collect at the Business Centre. Guests may also request for the documents to be delivered to their guestrooms. 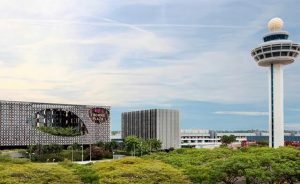 The rooms overlook the main building through floor-to-ceiling glass windows and guests can also look forward to enjoying a magnificent view of Jewel Changi Airport once it is completed in 2019. Commenting on the launch, Ms Leanne Harwood, Vice President of Operations, InterContinental Hotels Group (IHG), South East Asia and Korea, said: “Singapore has been ranked by World Bank as the best place in the world to do business and continues to attract over three million business visitors each year with a year-long calendar of major events and conferences. As the World’s Best Airport Hotel, its strategic location and seamless connectivity to Changi Airport perfectly caters to transiting passengers, while its proximity to nearby business parks makes it a suitable choice for business travellers. The Crowne Plaza brand is a trusted name for business travellers worldwide and we have seen strong demand since Crowne Plaza Changi Airport opened its doors in 2008. The hotel is connected to Changi Airport Terminal 3 via an air-conditioned pathway providing seamless access to the departure hall and other airport terminals. Major business districts such as Changi Business Park, Singapore Expo and Changi Exhibition centre are close by, providing superb convenience for meetings, incentives, conferences and exhibitions (MICE) travellers. Some of Singapore’s popular attractions such as Gardens by the Bay, Orchard Road shopping belt and East Coast Park for beachside recreation are a short drive away, offering plenty of options for guests to unwind during their leisure time. To commute via Singapore’s efficient public transport system, guests can hop on the Mass Rapid Transit (MRT) with Changi Airport station just a 3-minute walk away. In addition to Crowne Plaza Changi Airport, IHG has seven more hotels open in Singapore across four brands –InterContinental, Holiday Inn, Holiday Inn Express and Hotel Indigo, with the country’s second InterContinental hotel expected to open in 2018. For enquiries or reservations, visit www.crowneplaza.com/changiairport or call the toll-free number at 1800-787-1221. IHG® Rewards Club members can also enjoy exclusive rates for greater savings and earn IHG Rewards Club points from their stay.